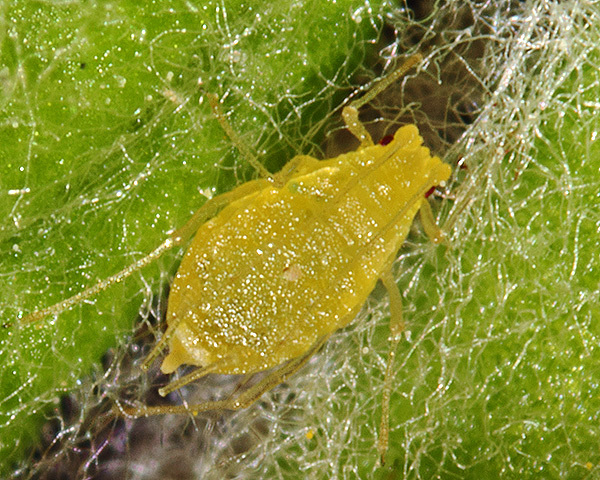 Adult apterae of Ovatus inulae range from lemon-yellow to pale green in colour. 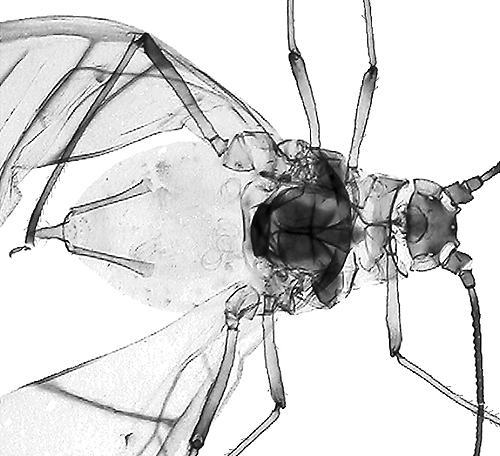 The head has a well-developed median frontal tubercle, as well as rounded forwardly directed processes on the antennal tubercles, all clearly visible in the first micrograph below. The fused last two segments of the rostrum (RIV+V) are 2.2 - 2.4 times longer than the second segment of the hind tarsus and bears 15-25 small accessory hairs (cf. all other Ovatus species which have a shorter RIV+V with only 2-6 accessory hairs). 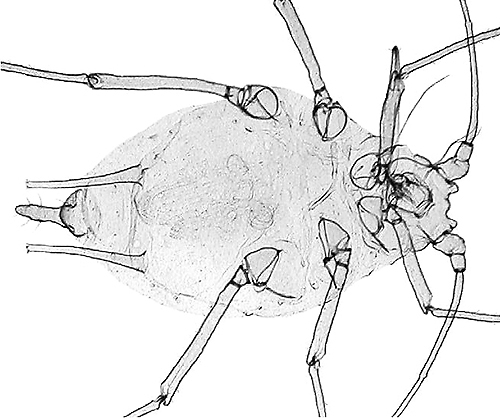 The body length of adult Ovatus inulae apterae is 1.0-1.6 mm. 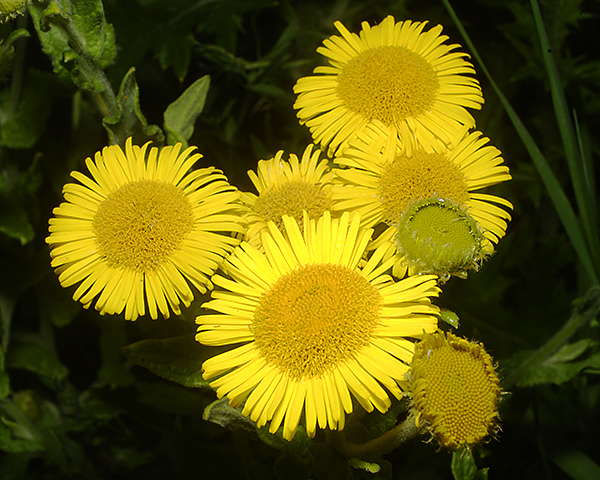 The main host of Ovatus inulae is fleabane (Pulicaria dysenterica), a common plant in Europe in marshy places. 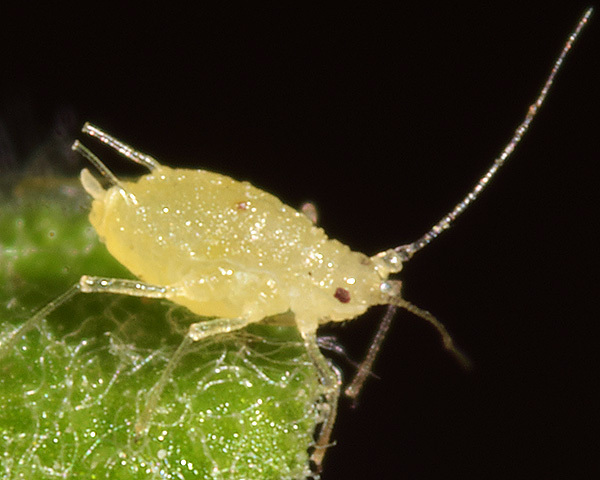 We have found the fleabane aphid Ovatus inulae to be widely distributed in southern England, and sometimes very common. The name 'fleabane' arises because smoke from burning the plant is reputed to drive away fleas and midges. 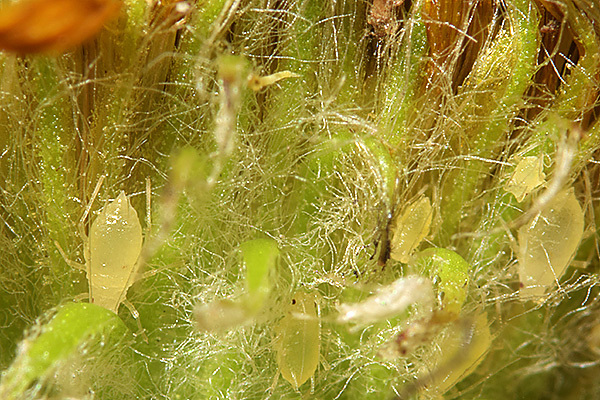 Chemical investigation of the Pulicaria genus has shown the presence of terpenes, diterpenes and sesquiterpenes. Various biological activity has been reported (Khan & Asghari, 2012), such as antibacterial, antifungal and insecticidal properties. 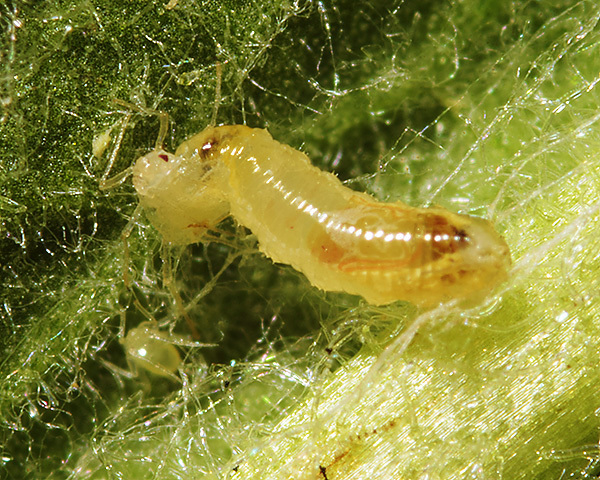 Ovatus inulae has evolved to tolerate the various chemicals present in its host plant. 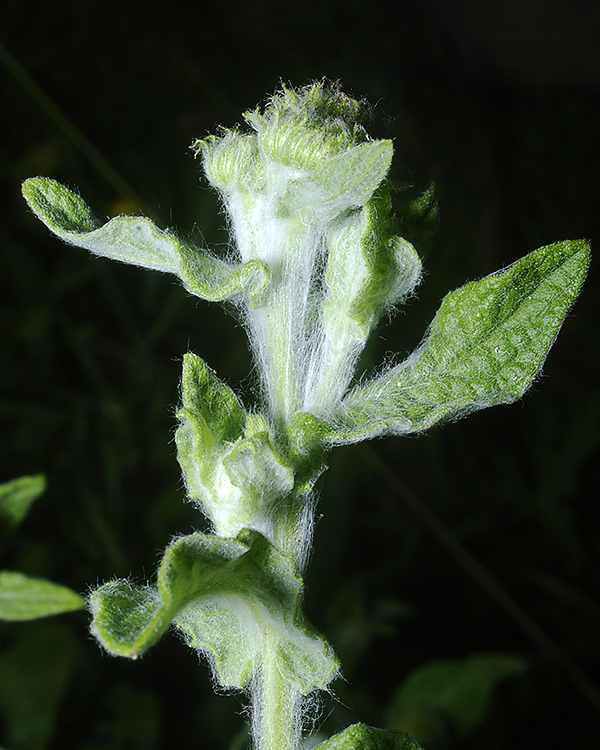 It is also able to deal with the long downy hairs of fleabane, which cover the leaves, stem and flower buds, by means of the unusually long last two segments of its rostrum. This is a common adaptation in aphids which feed on very hairy hosts (see our section on Uroleucon grossum, which feeds on Crepis). 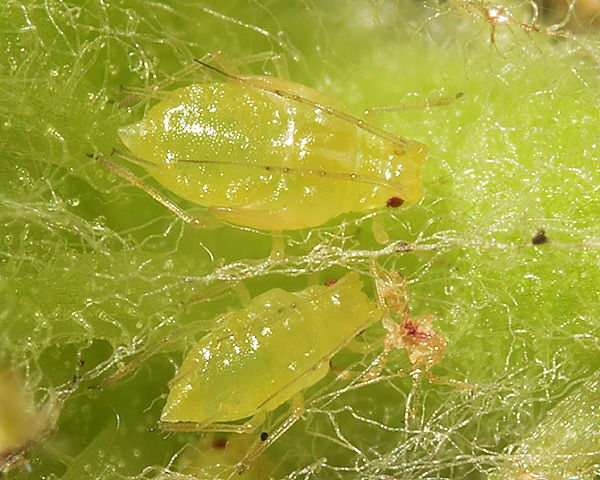 In spring and early summer we have found single aphids scattered over the leaves, but by late summer large colonies may be present, especially at the flower bases. This is the only time when we have found alatae developing on the plants - the picture below shows fourth instar future alatae, with the wing buds clearly visible. 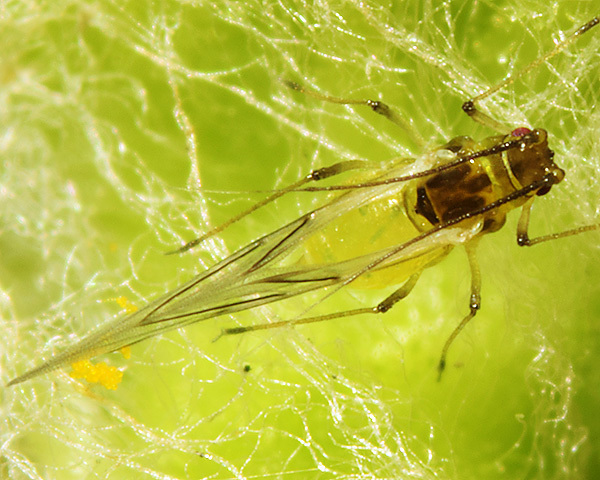 The large colonies are preyed upon by midge larvae (Cecidomyiidae) which often eliminate the populations on any particular plant. Ovatus inulae has been recorded from 1 Pulicaria species (Pulicaria dysenterica), 3 Inula species (Inula brittanica, Inula conyza, Inula helenium) plus Dittrichia viscosa, Galactites tomentosa and Helichrysum bracteatum. Blackman & Eastop list 11 species of aphid as feeding on fleabane (Pulicaria dysenterica) worldwide, and provide formal identification keys. Baker (2015) gives 6 of these as occurring in Britain: Aphis fabae, Aulacorthum solani, Brachycaudus helichrysi, Myzus ornatus, Myzus persicae and Ovatus inulae. 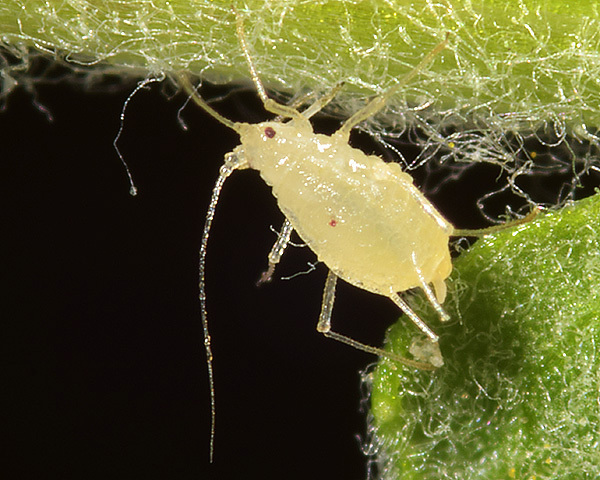 Note that Ovatus inulae is the only aphid which is specific to fleabane - all the rest are polyphagous species. The only other species we have found on fleabane is Brachycaudus helichrysi, alates of which colonize fleabane in June.